Discussion in 'News & Announcements' started by ChrisTurk, Jan 19, 2019. This is a large change, mostly aimed at moving TVJS into a slightly different role. Most likely moving forward TVJS will be more of a beta playground where I can test new features before pushing them upstream to more "stable" apps (Forker, MTS, etc). While we understand the old AA on www was being abused by some workers in order to submit poor quality work to requesters we don't think workers should be forced to fly completely blind. The gap between 1hr AA and 30 days is unacceptable for workers to make informed decisions. So we're going to work to responsibly fill in the gap for workers who prefer the peace of mind of knowing when (& how likely) a task is to approve given a good faith effort. Occasionally when you visit your dash or check in to leave a review TV will check the HITs you've reviewed & if they've approved fix the "fast" rating for you on TV by itself. 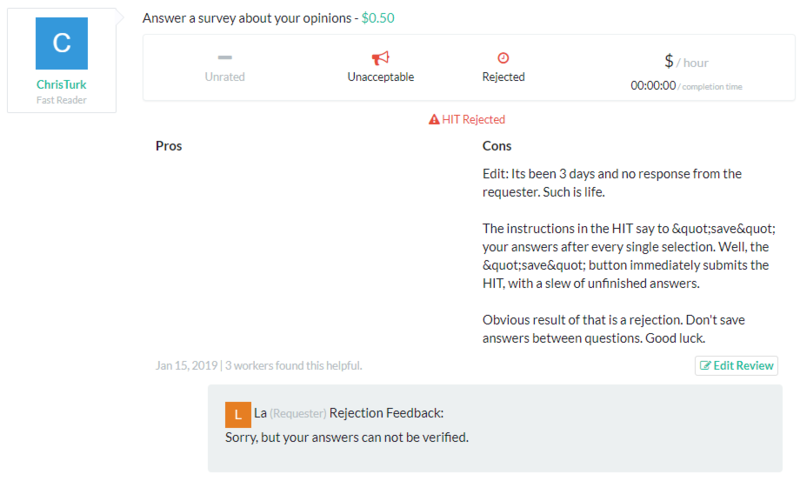 Rejections will not be auto-reported (there are good reasons to leave this up to the discretion of the worker, especially if they made a mistake and may have "deserved" the rejection) but TVJS will alert you if a HIT you've reviewed has been rejected so you will know it for sure & can update the review if you want. In testing w/ individual users this already accounts for about 75% AA time coverage which is an insane improvement versus the manual method TV has traditionally relied on. We'll be working on ways to back fill the existing data set as in many cases it has been tracked, just without the API to update the data. TVJS moving to the API servers means TV itself will have a lot more resources reserved for incoming data. Info boxes have been tweaked slightly to display information according to the new API standards. This isn't really important to end users, but TV's API will feed scripts data according to its ratings in order to help standardize metrics across the platform (such as approval time ratings, wages, etc). We'd like to see standards become the framework for interacting with requesters in ways that benefit both sides (quality data, quality pay). 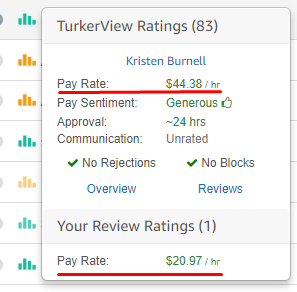 When we can send requesters things like "Hey, a 1-3 day approval time is "fair" we can help workers get paid quickly --- but all of those kinds of initiatives start with establishing what we want those metrics to be. If after community discussion we come to a consensus, and it doesn't match whats already there, this gives TV the opportunity to update information with scripts calling its data without forcing devs to dig into their code base & make adjustments/etc. Its complicated, we'll see how it goes. Info boxes will begin feeding individual user data back to the user. 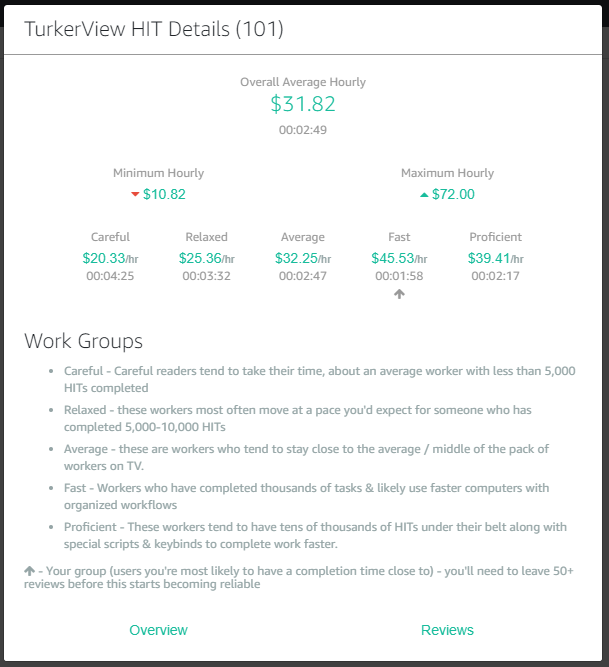 In TVJS10, that starts with your individual hourly wage average for any requesters you've reviewed through TV. For now, you should be able to see at a quick glance if a requester is good for you even if it isn't for others (or vice-versa). Instead of filtering people before they join the site, we're now going to use the same metrics (approved HITs, approval rating) in generalized aggregate data to "group" users together & begin feeding more tuned aggregate data to groups. This opens up more metrics to help users not only see the low/higher thresholds of tasks but also how they stack up with users similar to their experience/level on the platform. "Batches" are now tracked a lot better. 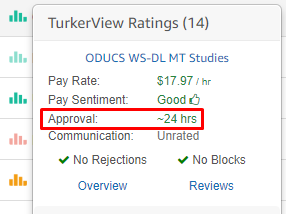 Its still not perfect, and I don't really recommend reviewing them, but its at least better for folks who want to do so. "No Share" button should be more reliable. Return reviews are now available on the HIT Preview page. This should cover the major highlights to TVJS. As always let me know of any bugs that crop up or changes/additions/etc folks would like to see. How do I leave feedback on a Requester once the hit has been Paid? I've been getting Requesters that pay within the last 5hrs or less (after completion) and would like to give them thier due atta-boy review. All that shows up now is a grayed out plus sign that expands when clicked and turns into a minus sign. somewhere on the task itself as well? I'm usually going back to the queue to see what color the icons are to see if the HIT is worth it.